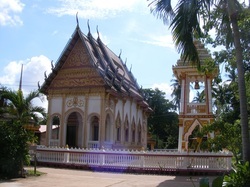 Wat Ban Nong Bua is a small and reasonably typical temple when viewed from outside the entrance gates but there are a number of features that make this temple stand out from most in the immediate area. 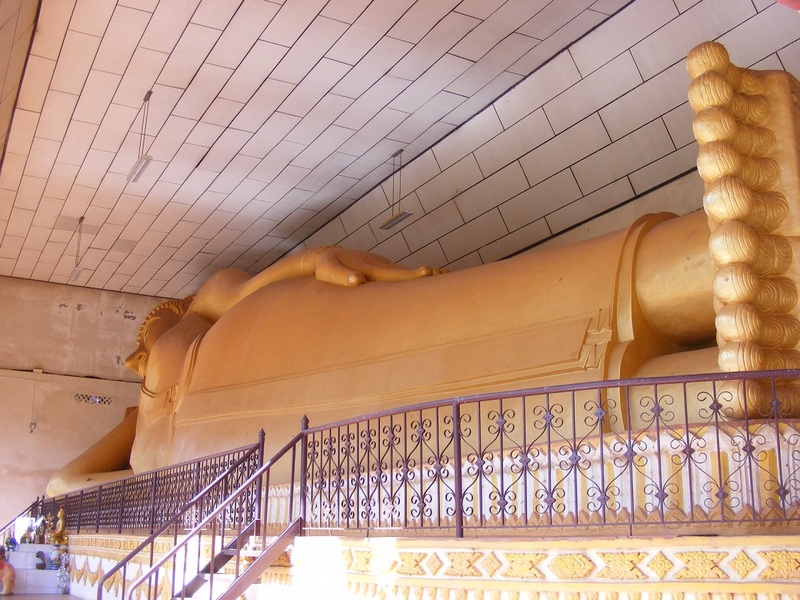 Indeed the 20m reclining Buddha could be mistaken for that seen in the Golden Palace in Bangkok. 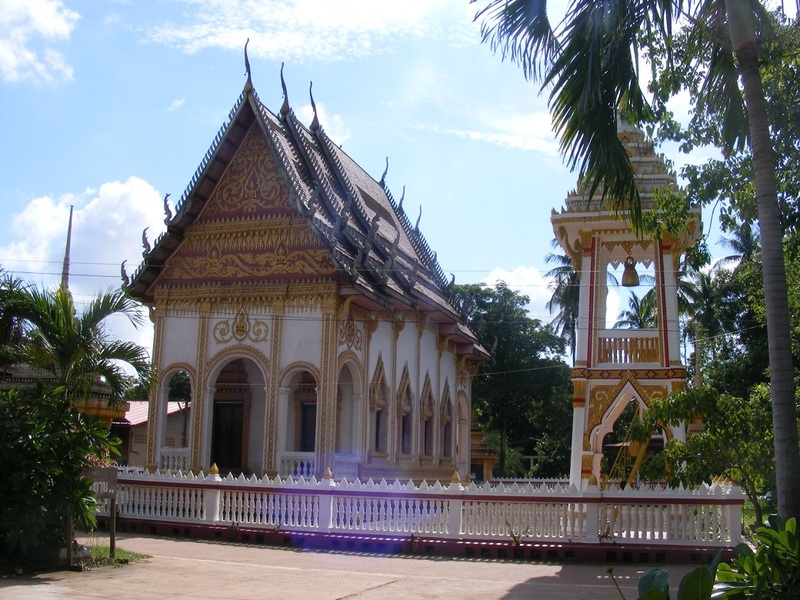 This is the nearest temple to our home and is just a one minute motorbike ride away, and is on a route I often take to leave the village or to go to the nearby Tesco Express store. 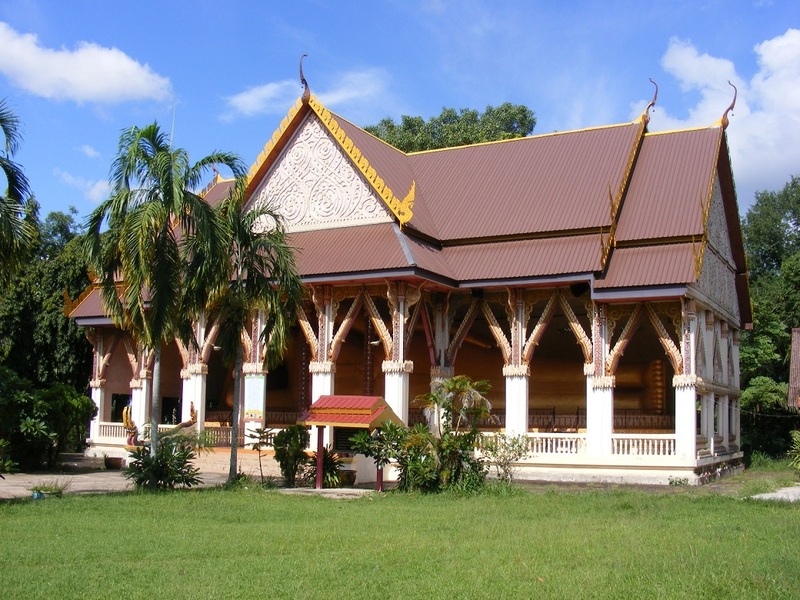 For a small village with a population of just a few hundred, Wat Ban Nong Bua is quite a visually significant temple and well worth a visit while in the area. On entering the temple grounds from the directions below, the first thing that catches the eye is the large grassed area on the left and if you look a little further you will see two of the smaller statues in the near distance. One is a traditional Buddha head while the other is a Buddha surrounded by Nagga Snakes which are very common in this region. If you turn round as you pass under the entrance gate you will see a highly decorative 'archway', littered with many small ornaments. 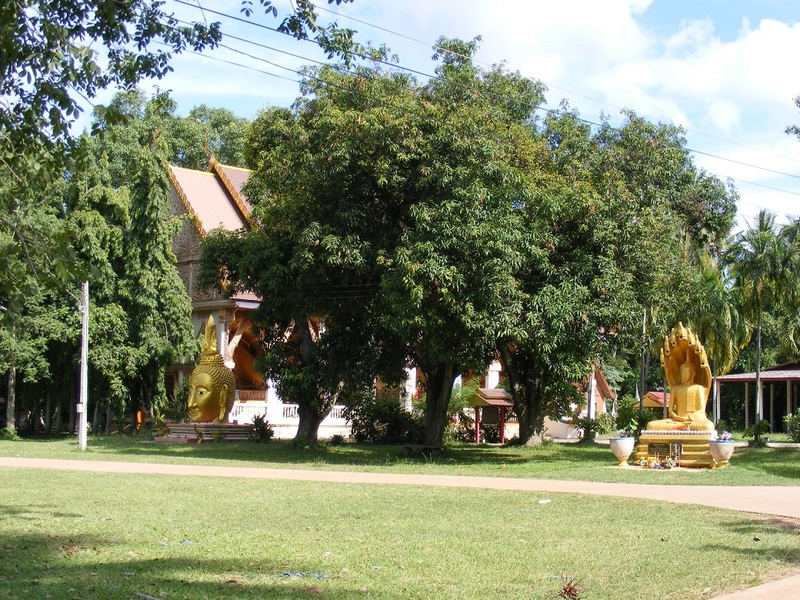 If you keep going straight on the entrance road the next feature is a temple on the right but directly opposite is another building which houses the reclining Buddha. Depending on light conditions it is not always obvious that there is such a large figure inside as there are lots of pillars partially obscuring the view. A little further down the road, towards the rear of the grounds, is another large Buddha, this time sitting on a raised plinth. 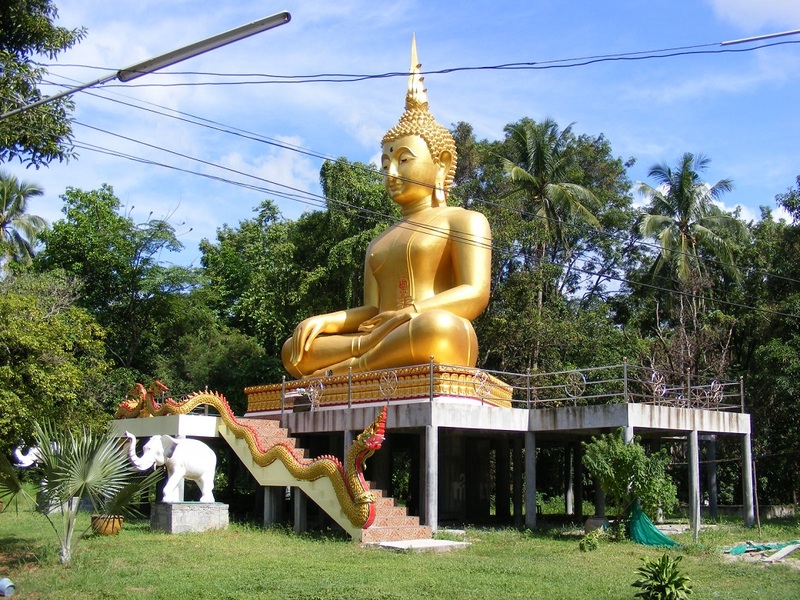 This large statue is somewhat ruined by the low level electric cables that cross the temple grounds. Alas this is commonplace for Thailand and something we just have to accept, no matter how unsightly they may appear to be. 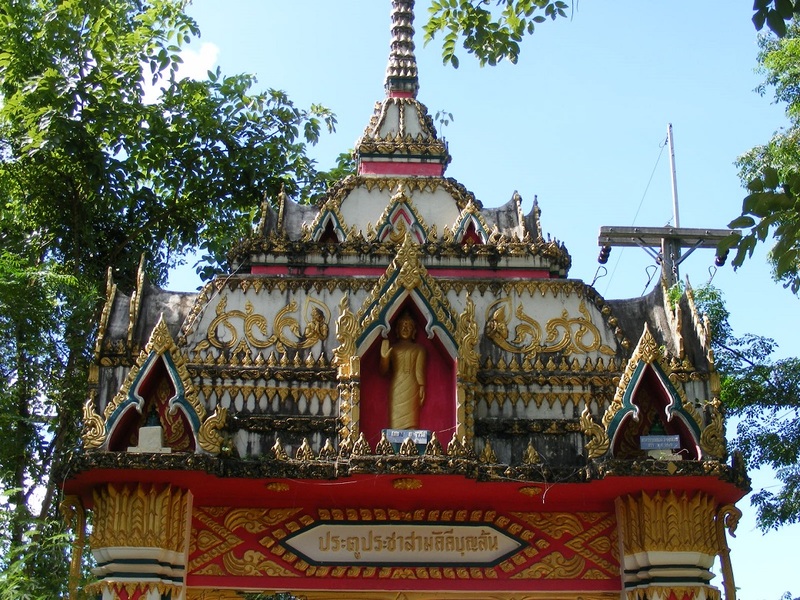 The temple serves the village of Ban Nong Bua which is actually on the opposite side of the main road, which in itself is barely noticeable when the Mae Bua Daeng Market is not very active. It really only becomes apparent that there is a village here from about four in the afternoon, when the kids come home from school and the mums go out to buy food for the evening meal. Wat Ban Nong Bua is just to the east of Udon Thani on route 2410 which heads to Sam Phroa. 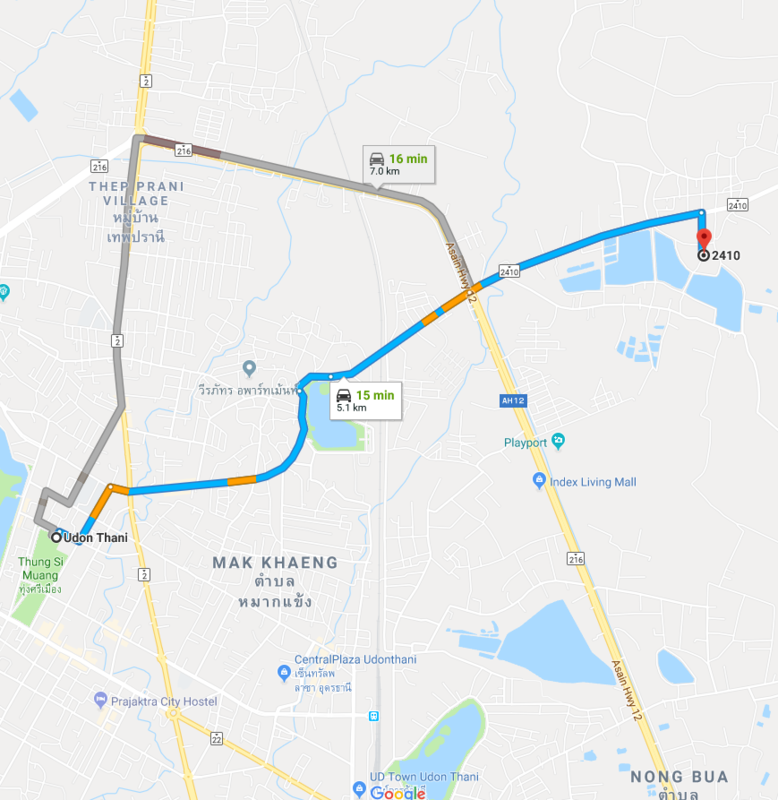 From Udon Thani, go past Nong Sim Park, over the railway crossing and straight over at the crossroads with the ring road. After about 2km you will see a Tesco Express (Lotus) on the right hand side, having passed a few large lakes. Just beyond the Tesco store, on the same side of the road, is the entrance to Wat Ban Nong Bua. Follow the straight concrete road to the grounds and park anywhere you can find space and feel free to wonder around.